Designing a DIY water feature can be a challenge if you are on a tight budget. It can be even more of a challenge if you are looking for a contemporary water feature to fit in with an updated garden space. Here is a great solar powered water feature that combines the beauty of natural materials with a more modern design, and does it all for less that $25! Several flat concrete pavers, depending on the size of your container. 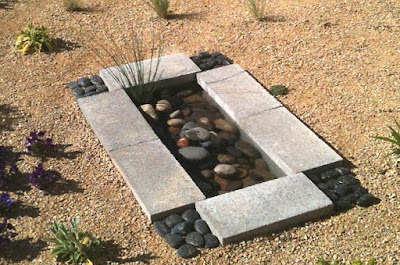 Decide where to place your water feature. If you don’t have power nearby, consider a solar powered fountain pump. Keep in mind, solar pumps ONLY work while the sun is shining! If the sun even goes behind a cloud, the pump will temporarily stop. If you plan to add live plants, make sure to site your water feature in the sun. 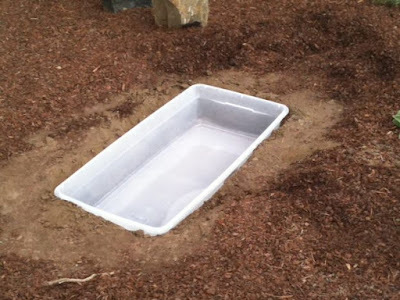 Trace the shape of the container onto the dirt, then use a shovel to remove enough dirt to sink the container level with the ground. 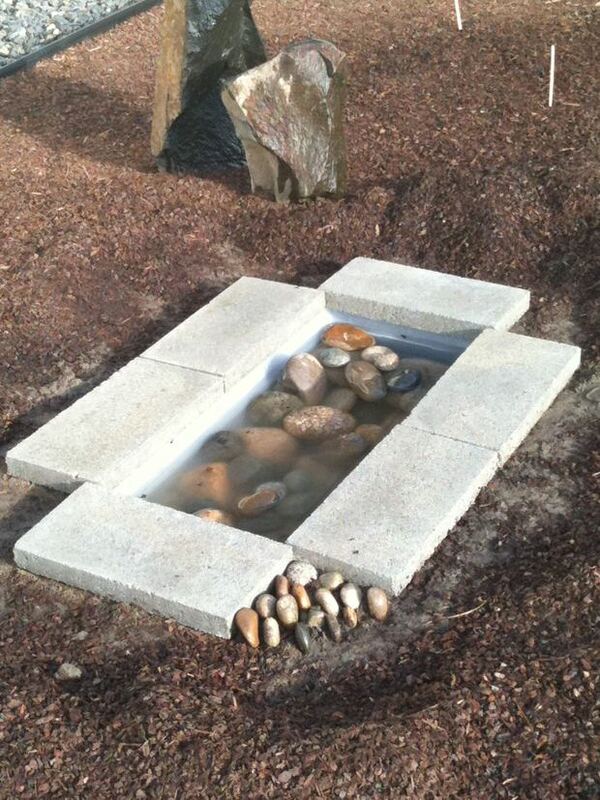 Add large rocks to the bottom of the water feature, then use the rocks to anchor your pump in place. Lay the pavers along the edge of the water feature to cover the container edge, and to help hide the power cord. 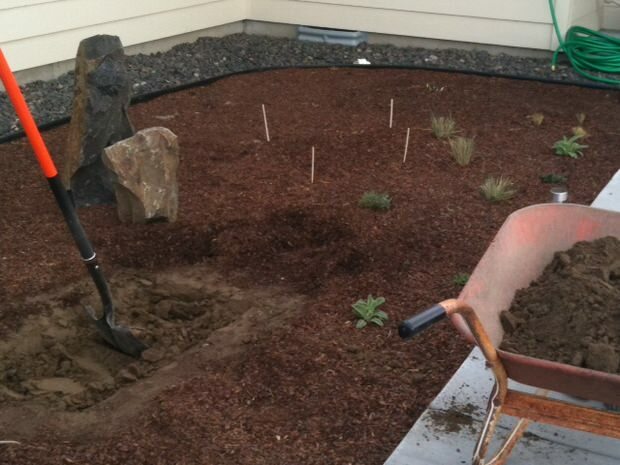 You can dig a trench for the power cord to hide it, or simply wind it behind plants to camouflage it. Use flat stones to fill in the corners where the pavers don’t meet. Use your creativity to put your own twist on your design. If you are using a water plant, place the entire pot in the water feature so that the rim will sit just above the water line. A black pot will be nearly invisible in the water. 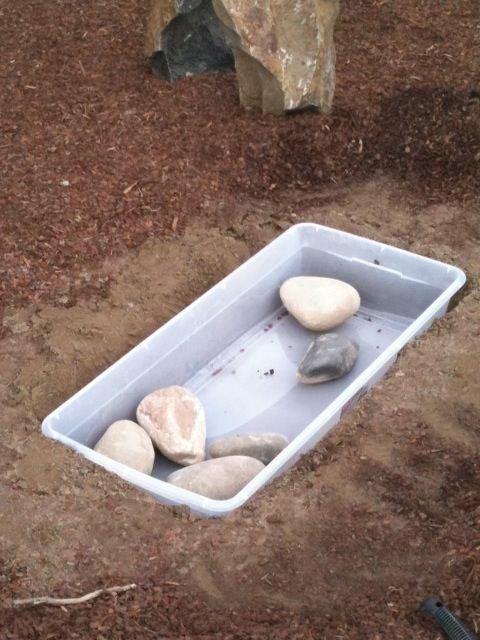 Use more rocks to fill your water feature, hide the container and hold the plant in place. Try to use a mix of different colors, shapes and sizes. Fill with water, plug in the pump and adjust the spray until it makes the sound and effect you are looking for. You can choose a fountain spray, or a natural bubbling over stones. Clean your water feature on a regular basis, and use an algae inhibitor available at your home improvement store where they sell pond supplies. 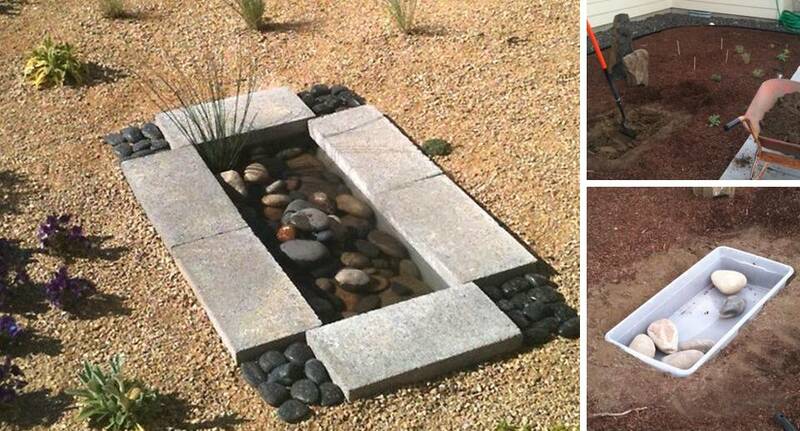 Easy DIY water feature project for a contemporary garden… that anyone can do, on even a tight budget!